CANTON, Mass. 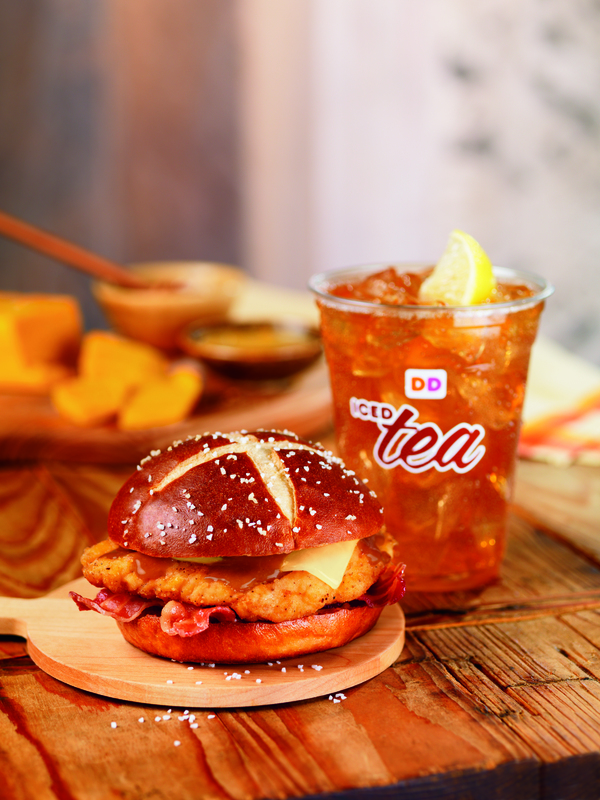 (March 30, 2015) – Dunkin’ Donuts is rolling into spring with a crispy and delicious new addition to its menu, today introducing the new Pretzel Roll Chicken Sandwich. Dunkin’ Donuts’ newest sandwich rollout features a breaded chicken filet topped with bacon, white cheddar cheese and honey mustard on an oven-toasted pretzel roll, and is available for a limited time at participating Dunkin’ Donuts restaurants nationwide. The new oven-toasted pretzel roll is available, for a limited time, as an option on any Dunkin’ Donuts bakery sandwiches like Chicken, Ham & Cheese, Turkey, Cheddar & Bacon and Chicken Salad sandwiches. Adventurous eaters can even try a pretzel roll on any breakfast sandwich. Additionally, Dunkin’ Donuts is introducing a new Snack ‘N Go Steak Wrap featuring Angus Steak, a slice of reduced fat cheddar cheese and honey mustard sauce folded in a five-inch round tortilla. The Snack ‘N Go Steak Wrap is a smaller portion size than the usual bakery sandwich and has 210 calories. To make the spring season even sweeter for donut fans, Dunkin’ Donuts is introducing two new varieties of Cheesecake Squares, including an OREO® Cheesecake Square and Raspberry Cheesecake Square. The new OREO® and Raspberry Cheesecake Squares are filled with smooth and creamy cheesecake filling, frosted with white icing and finished with raspberry flavored candy or crumbled OREO® cookies. 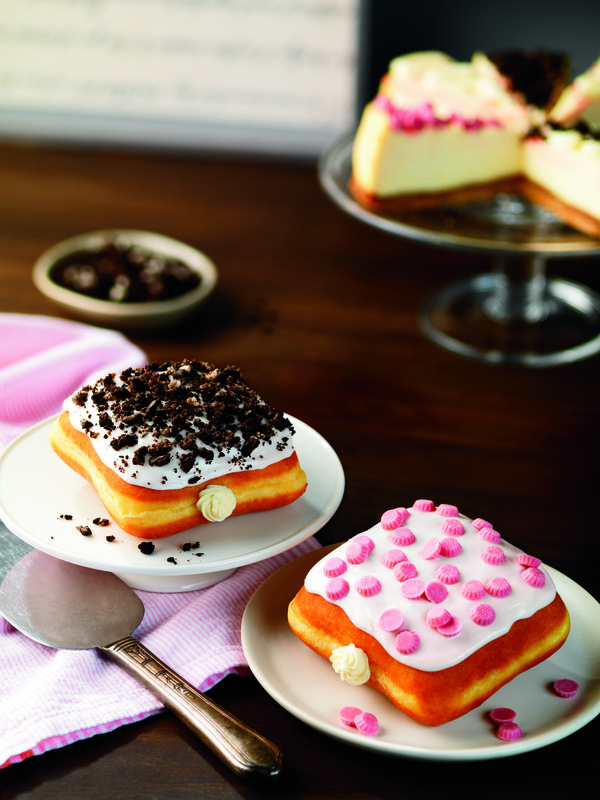 Available through April, Dunkin’ Donuts’ new Cheesecake Squares are the perfect sweet treat for any time of day. Finally, this spring Dunkin’ Donuts is offering a new Southwest Supreme Bagel. A plain bagel topped with melted Colby Jack cheese, corn, black beans, peppers, tomatoes, onions and spices, Dunkin’ Donuts’ new Southwest Supreme Bagel is sure to heat things up as the temperatures rise. The Southwest Supreme Bagel is served warm and will be available for a limited time at participating Dunkin’ Donuts restaurants nationwide.